Finally a chat software for people on the go (that don’t want to learn anything new)! We’re all about new and shiny so long as it serves a purpose and our latest feature coming down the pipe is all purpose with a neat little bow of efficiency tied on top. So far we’re calling this new lead routing feature Tag. Not to be confused with #, #tag or hashtag. This feature has nothing to do with social media grandstanding and everything to do with survival of the fittest. It works on the same basic principle as a grade school game of playground tag, but in this system the lead is it, the sales people are being chased and want to be tagged and your brokerage, dealership or businesses sales force is the roster out on the playground. SYNCRO will now take that lead and fire it out via text message to everyone on your sales roster at the exact same time via text message – in this example we are using a 300 agent real estate brokerage. The first person to respond to the incoming question using SMS from their mobile phone, will secure the lead and is free to continue the conversation via SMS back to the live chat window where the customer is visiting the website. Everyone else from the roster is deemed too late to the chase and can play again next round. Aren’t there other companies that already do this? Not without an app, or an untrained, unlicensed call center flagging your chats there aren’t! This feature is currently moving to open beta and we will be contacting current SYNCRO clients with large volume sales teams to inquire about participation shortly. However, if you are not yet a client, have a big team and you want to test it along side us now – please SYNCRO us for more details. Otherwise keep your eyes, ears and mobile open – you never know when you might get Tagged. Why you want a live chat solution that goes mobile, and we don’t mean an app. So you have an awesome looking website, and it appears to be generating great search engine traffic among other sources, but you don’t seem to be getting any inquiries about your products or services. There is a good chance that the way you designed your website isn’t exactly answering the questions that many consumers might have about your products / services. It has been proven that until recently, most people would pick up the phone to ask if you offer this or that. They may have even take the time to fill out a contact form to wait for a response… Since the advent of live chat, consumers expect there to be a way for them to engage with you instantly, so to be able to validate your company and or services. Having a live chat option on your website will allow people to ask the questions they have, and determine if they want to do business with your company in a quick and easy way. Live chat software is an incredibly versatile way to ensure someone is available to answer your customer’s questions quickly and with intelligence. There are some downfalls to have a live chat tool in your website if you are not using the right service. For example, having someone manage your chat on your behalf will just delay the right answers your customer is looking for, and frustrate you customer. There is absolutely 0 value in having a chat tool that is acting as a message answering service for your business. Be wary of live chat companies that use staff to respond to your chats, as this can destroy your lead generation, and provide unhappy customers to never purchase with you again. The second biggest problem with standard live chat software is that you need to be logged into the application and sitting behind a PC to communicate. So many of us operate our business away from our computers which is why the standard model of live chat doesn’t work any longer. Live chat needs to go mobile for it to work with any degree of effectiveness. Imagine as a chat comes in you can engage with your clients in real time from the coffee shop or from your backyard because you needed to get a bit of yard work done. There are two types of live chat software that drive conversations to your mobile phone, they can either operate as an app which means you have to have a special phone, with the most up2date operating system, be connected to an internet connection, and ensure that you are logged into the app for it to work. You don’t need a special phone for the mobile chat to work. You don’t need to learn anything new because everyone already knows how to use text messaging or SMS. You don’t need an internet connection, only an SMS enabled phone. SYNCRO live chat to text is an incredibly powerful chat solution that drives leads directly to your mobile phone so you can interact with them anywhere, anytime. 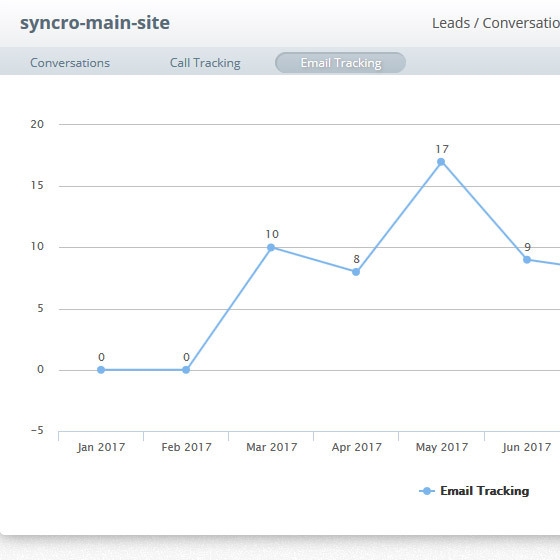 SYNCRO tracks everything and allows you to see everything from click to chat data, text me data, email tracking and more. To learn more about SYNCRO, and how it can improve your customer relations, and improve lead generation, please start a chat with us now!